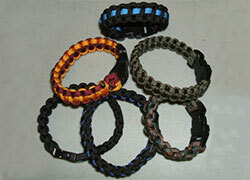 550 Paracord 7 Strand Bracelet P96. 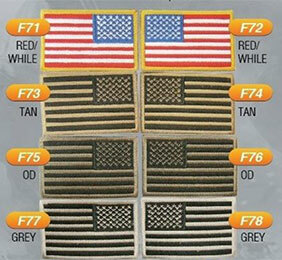 Comes in Red, Red - Black, Blue, Beige, Black, White pattern, Black - Green, Green. 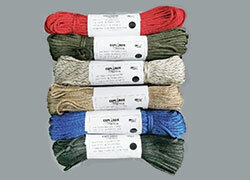 7 Strand Emergency Cord - 100 feet. Comes in Red, Green, Pattern, Beige, Blue, Dark Green. 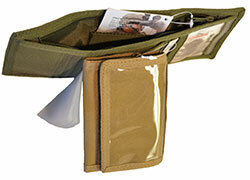 600D Polyester Wallet. Comes in Black, ACU, OD and Tan. 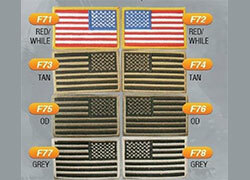 2 x 3 US Flag. Comes in Red/White, Tan, OD and Grey. Review Styles available.